With Australia Day very nearly upon us, this image of Captain Cooks Landing Place, from a postcard dated to 1906, seems an appropriate choice. Many Sydney residents and visitors are familiar with the monument, and most know of the event it commemorates, but the history of the actual monument, and others at the site is much less well known. Captain Cook arrived in Botany Bay in 1770, and his visit was the very start of the process which led to European settlement in Australia. Although we now know he was not the first European to sight our shores, his visit is an important moment in the history of Australia and has, as a result, been commemorated on the shores of Botany Bay where the landing occurred. 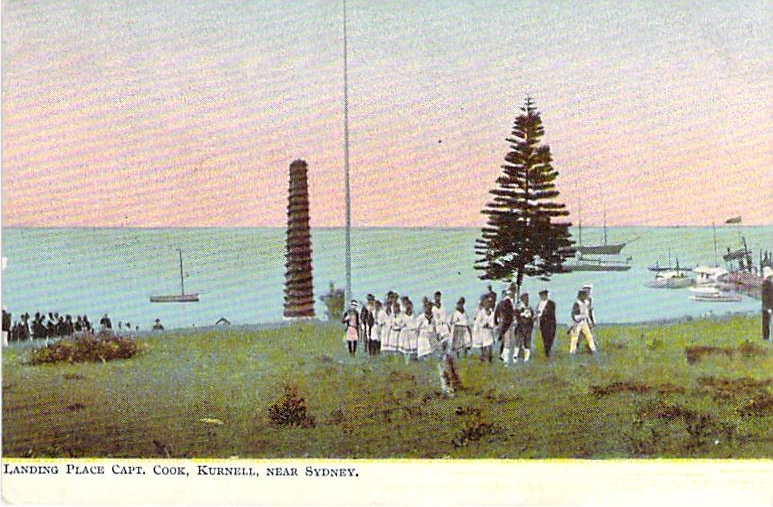 The grand sandstone obelisk which features in this postcard was completed in 1870, the centenary year of Captain Cooks actual visit and commemorates that important event. Another plaque was affixed to the obelisk in 1970, and this was done in the presence of Queen Elizabeth, who was visiting Australia at the time. This plaque commemorates the passing of 200 years since Captain Cook and his crew visited the area. This monument has become an important part of our history, and many visit it to remember the ‘discovery’ which led to European settlement. Captain Cook did not, of course, make the journey to the Great Southern Land alone (or even on purpose, though that is another story!) and there are several other monuments scattered around the area where the landing occurred. Other monuments celebrate Dr Solander, Joseph Banks and Forby Sutherland (the latter being the first British subject to die in Australia). This entry was posted in New South Wales, Sydney Suburbs and tagged 1900s, beaches, exploration, famous people, government, postcard collection, sydney, sydney harbour.